About InterPersonal Theory « CONSTABLE RESEARCH B.V.
World Views are Perspectives on the Inner and Outer World. “Every man has his own Universe” so there are so many Perspectives as there are (and were) Humans. To communicate we have to decrease the Amounts of Perspectives. Will McWhinney has found a model that covers most of the perspectives of the Human Being. It contains Four Perspectives circulating around a Center. His model is Self-Referencial (A Fractal) which means that the Model can be Applied on its Self. It can be expanded to the Infinite Perspectives of all the Humans on Earth by detecting the Right Enfolding of the Fractal Pattern. When I was working with Will McWhinney on his theory of World-Views I found many theories that could be mapped to his Theory of Change. The World Views proved to be a generic explanation of almost everything. This was a big surprise. One of the sciences that interested me the most was Psychology. I studied Philosophy, Psychology, Chemistry, Physics and Mathematics and kept my knowledge of these fields always Up-To-Date. My main problem with Psychology was the conceptual mess it was in. I read book after book and all the time new ideas came up. It was fascinating but also frustrating. Suddenly I found a book that helped me to see everything from one Perspective. The book contained a Model and I was able to Map the model to the World Views with ease. The book I found was Horowitz, L. M. (2004). Interpersonal foundations of psychopathology. Washington, DC: American Psychological Association. Interpersonal theory looks at the world from the perspective of Relationships. According to attachment theorists, the infant’s attachment system keeps the child close and connected to the adult, thereby increasing the child’s chances of surviving infancy. As children come to feel sufficiently secure in their attachment to the caretaker, they separate from the caretaker and explore the environment, a first step toward autonomy. When a person initiates an interaction with another person, the other assumes that the behavior is motivated (purposeful). When an important goal is satisfied, the person experiences a positive emotion; when it is frustrated, the person experiences a negative emotion like sadness or anger. Internal motivations can be conflicting. This can result in serious mental disorders. The interpretation of the motivation of the other is often ambiguous leading to misunderstanding and even conflict. To resolve these potential conflicts an open dialogue is necessary where people make their motives clear to others (and themselves). Motivational constructs (desire, motive and personal striving) can be conceptualized in two very broad, abstract categories, namely, Communion and Agency. A Communal motive is a motive for a connection with one or more others; it is a motive to participate in a larger union with other people. A communional motive can range from Indifferent (no connection) to Love (a complete connection). An Agentic motive, on the other hand, emphasizes the self as a distinct unit; it focuses on the person’s own individual influence, control, or mastery over the self, other people, and the environment. An agentic motive can range from Dominating to Submitting. 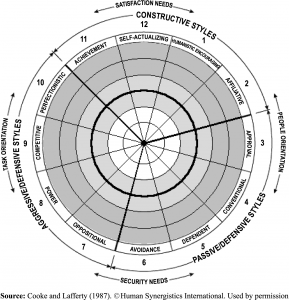 Interpersonal behavior can be described with the so-called Interpersonal Circumplex (a Cycle). This is a widely tested model that predicts the reaction of a person to a Motive (a combination of agency and communion) of the other. The motivational behavior of a person is more or less determined in his youth. People that are extreme in the connection/agency-matrix (e.g. indifferent to the other, too dependent, very dominant or submissive) are unable to work in a collaborative manner. They are Psychopathic. Interpersonal Theory is very helpful to understand relationships. The Interpersonal Circumplex or Interpersonal Cycle suggests that there are Infinite Types of Relationships. Some of them are named (Friendly, Dominant) most of them are not named. When two persons are reacting according to the complementary expected behavior of the Other they feel “Related“. A highly dominant partner, a Master, needs a highly submissive partner, a Slave, and vice versa. By using the World Views Interpersonal Theory can be easily mapped to other Psychological Subjects like Learning. When we use the method of Mapping it can also be transformed to Art, History, Ecology, Mathematics and Physics. To use the Four World Views (Unity, Sensory, Social and Mythic) we have to Map the Matrix of Horowitz to the Matrix of McWhinney . Sensory people (Experts) are disconnected from their Self (Ego-istic). They are focused on the Senses (Facts). An addiction to the Senses is called Schizophrenic. Mythic (Artist) is a Union with the Self. Mythic people are highly Imaginative and Creative. An addiction to the imagination is called Histrionic. Social is a Union with Others. Social people are highly Emotional and influenced by the Other (Status). An addiction to the emotions is called Dependent. A Unity (Master) is disconnected from the Self. Unity people want to control the Future. They are planning and expecting. An addiction to Control is called Paranoid. Consciousness, the Observer, the Center of the Cycle, is a Balance between Communion and Agency. People that are Constantly Out of Balance are called Neurotic. Paths of Change explains why Life is a Paradox. It is a Paradox because the World Views are completely independent. They are valid ways of Looking At the World. “Normal” people combine Two or more Worldviews and are able to Switch from one View to the Other but they always look with one View at the Time. “Normal” people are mentally ill but we don’t see their illness because they are Switching all the time. The Switch is called a Relation in Interpersonal Theory. It connects two parts that are disconnect and will always be disconnect. Is there a Structure behind this Structure? Behind the Four WorldViews lies a much simpler structure. This structure contains just Two Views, the View of Control and the View of Desire. Control is the proces of Compression. Control makes thing simple and essential. It brings everything back to the Void, the state of Infinite Potential. Desire is the process of Expansion. Expansion makes things more complex. It generates an infinite amount of new combinations. It moves away from the Infinite Potential. Control and Desire are Complementary Powers. When they join they are annihilated. If this happens They combine and become the Void again. Control and Desire are constantly moving around the Void to A-Void that they move back to the state of the No-Thing, that is Every Thing. The Four Views are nothing but Four Combinations of the Two that are Avoiding the Void which is the Center, the Connector, the Relation, the Switch, between Every Thing. This entry was posted on Saturday, September 22nd, 2007 at 5:19 pm	and is filed under Completed, Psychology. You can follow any responses to this entry through the RSS 2.0 feed. You can leave a response, or trackback from your own site.